This is the first in a series of battle reports exploring Üthdyn, our homebrew fantasy setting. Üthdyn was developed collaboratively using Microscope with the idea that it it would be a shared fantasy setting, not tied to any one particular game or rule set, that we can use to play out all manner of tabletop games, from small skirmishes to grand battles to RPG adventures, and more! It’s a genre mashup that combines our favorite parts of Warhammer, D&D, Game of Thrones, Tolkien, plus a bunch of other sources. Anyway, this game was set during a period referred to as The Famines, when the small baronies and fiefdoms of Glostmurk were weakened by years of successive crop failures and economic woes. Think of Glostmurk like Eastern Europe … lots of small regions, all jammed together side-by-side and forced to deal with increasingly chaotic situations. In our storyline, The Famines period leads directly into a period called the War of the Coins, which resulted in the collapse of the dwarven city-state of Miravec, so you can see where this is all going. As we imagined it, games set in The Famines will often focus on border raids and mercenary actions, rather than full-blown armed conflict. In this game, foul ratmen raiders from beyond the borders of Glostmurk swept into the small hamlet of Glodd to carry off the grain stores and livestock that the pitiful villagers were counting on to see them through the winter. Luckily for them, the Wealth of Begovich (the main noble house in the region) anticipated this move and was able to muster a motley collection of militia and elite house guard to stymie the raid. We used this game as an excuse to try out Dragon Rampant, which is quickly becoming our go-to game for medium-sized fantasy skirmish. I have played a few games recently, but this was to be John’s first game. He was commanding the Wealth of Begovich army, featuring some of his newly painted spearmen from RuneWars. We used the “Crystal Gale” scenario from the Dragon Rampant rulebook, only instead of crystal shards, we were competing to seize livestock and barrels of supplies. This was a fun opportunity to use some of my livestock models that I’ve had bouncing around in my scatter terrain box for the better part of a decade. The center of the battlefield was dominated by a few rude huts — all that remained of the hamlet of Glodd. The barrels and livestock represent the objectives. As the game got underway, we realized that I was at a significant advantage, because my army had a number of units that moved 8 inches per turn, whereas John had none. I quickly pounced on a few objectives and it became clear that the odds were in my favor to win the scenario. But! There’s more to the game than just winning the scenario. We decided to play it out to see if the Wealth of Begovich could deliver a sting to the raiders. 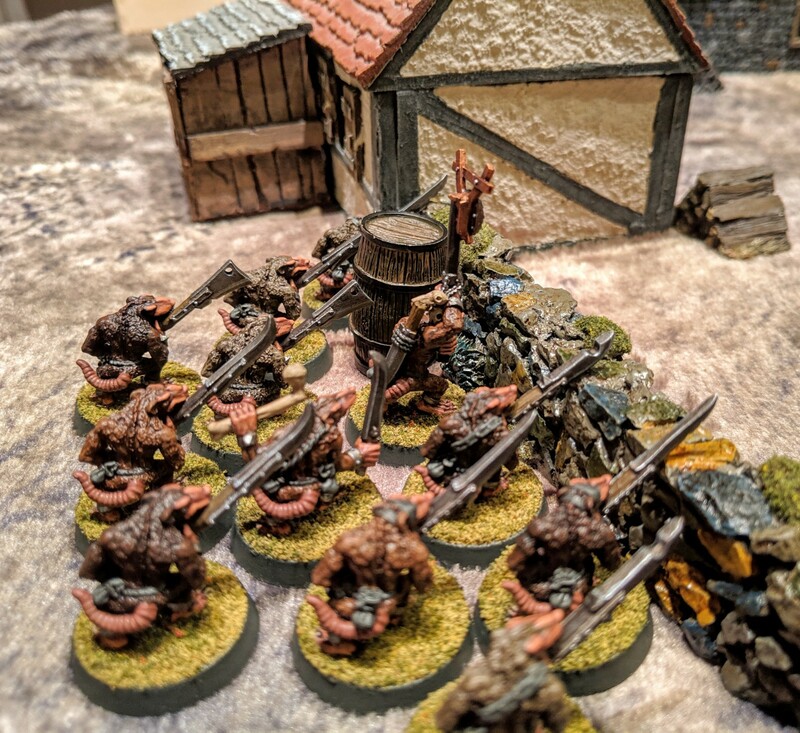 Even as my ratmen were butchering cattle in the fields and quartering the carcasses for easy transport, John’s scouts and militia were creeping forward to ambush the attackers. Over in a copse of woods on the right side of the battlefield, a squad of infantry (light foot, in the parlance of Dragon Rampant) drew their sabers and pistols as they faced off against a pack of were-rats (lesser warbeasts in Dragon Rampant). The giant rats gave as good as they got, and although they didn’t destroy any complete units, they definitely kept pressure on John’s flank. He could never completely ignore them, and at times he faced some tough decisions about where to commit his reserves, knowing that giant rats were scurrying around the backfield. The main clash came down in the center of Glodd, which was home to several objectives. My newly painted Skaven slaves (vintage metal, baby!) swarmed over a barrel of jellied fish heads, carrying off the pungent prize and then vaulting the low stone wall to advance further into the village. Meanwhile, John’s advance ran right up against an interesting rule in the Dragon Rampant rulebook, which states that no unit can be closer than 3 inches to another unit. I’ve always casually brushed that rule aside, as it seems needlessly strict and doesn’t seem tied to any particular game mechanic. But we decided to play it as written this time. For John, that meant his units had a hard time converging on the barrels in the center of Glodd, because they had to carefully maneuver around each other to stay 3 inches away. Here’s a look at his determined advance. The leader of my warband and his foul retinue (elite foot in Dragon Rampant) stuck to the shadows, allowing their massed infantry to do the dirty work. This was for good reason — before the game began, we rolled randomly to select a unique trait for our leaders. My poor ratman rolled “Weakness” as his trait (yes, a few are negative, though most are positive). We interpreted this to mean he was HUNGRY and weakened from lack of food. In game terms, his unit rolled one less dice in combat, so I wisely tried to keep him away from the front lines. Meanwhile, John’s skirmishers continued to pepper the ravenous ratmen with arrows as they lurked near a low stone wall. 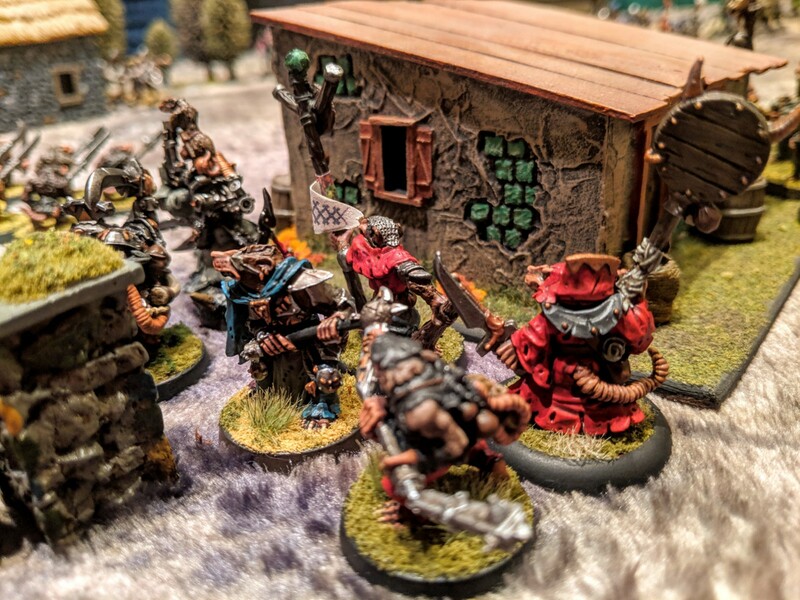 These guys were able to use their “skirmisher” ability to move and shoot a few times during the game — once actually evading combat entirely by melting into the trees when the ratmen slaves tried to charge in! When the slave finally reached combat, it was against a vastly superior unit — John’s elite foot, which included his leader, Lady Almira Begovic! Oops…that was not the matchup I was seeking with my lowly unit of slaves. So we clashed, with predictable results. The slaves were beaten badly and forced to flee, where they stayed for most of the rest of the game, doing a whole lot of nothing while the game was decided elsewhere. Here’s an overhead look at the battlefield shortly after the slaves fled. You can see the they have far fewer models now, and a red marker indicating their “battered” status in the game. Battered is Not Good and typically results in the unit continuing to bleed casualties and/or flee until it is annihilated. After a couple turns maneuvering and fighting on the flanks, the armies finally positioned themselves for a decisive clash in the center of the hamlet. John managed to bait my plague monks (bellicose foot in Dragon Rampant) into charging his light infantry due to the monks’ wild charge ability, which meant that they had to charge the closest unit in range. This ability is intended as a drawback, but it’s balanced out because bellicose foot are quite good in close combat, and they can charge through rough terrain without a penalty. Here are the monks emerging from a small wooded area, hoisting their rusty, filth-encrusted weapons. I had give these plague monks the Venomous special rule to reflect their plague-drenched weapons. That made them cost 7 points — easily the most expensive unit on the battlefield for our game. I like that special abilities like this in Dragon Rampant are flavorful but not unbalancing. 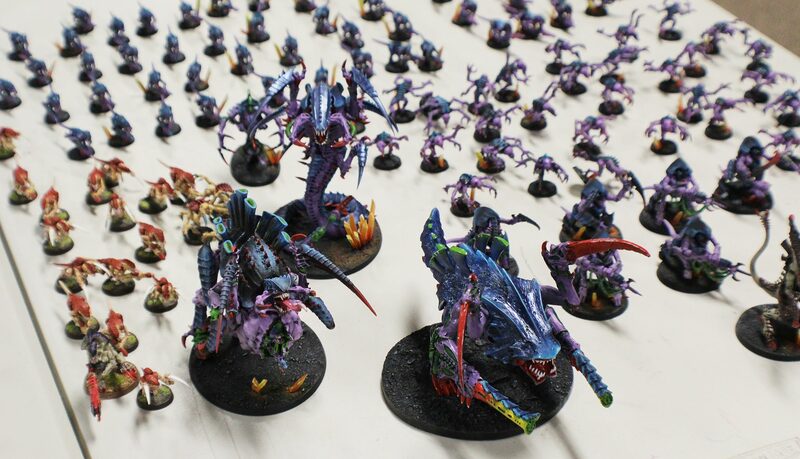 Nothing is cheap enough that you’d want to take it by default — for example, if I gave every unit in my army the Venomous ability, I’d only be able to field half as many models. Anyway, Venomous means that any sixes I roll when attacking count as two hits, rather than just one. Combined with the already-great combat abilities of bellicose foot, that meant I was expecting a lot from my plague monks! And they delivered. Here’s the epic clash with John’s newly painted spearmen. I ended up rolling four (4) sixes in that combat, inflicting 8 automatic hits in addition to a handful of additional dice that scored hits. The result was a near-rout for the spearmen. With that, we proceeded to declare victory for the ratmen. In the narrative, the ratmen slaughtered the livestock and stole the food stores and torched the huts and poisoned the wells and salted the fields and basically behaved very badly, before slinking off to their hideout in the hills and leaving Glodd to rot. Of course, we’ll need to schedule some subsequent games to see where this narrative thread goes. Maybe the ratmen muster a larger horde and press their advance by besieging a fortified Begovic border stronghold? Maybe Lady Almira recruits a few of her family’s clanking, steam-powered war machines and employs them root out the squeaking menace that plagues their lands? Leave a comment and tell me what you’d like to see! 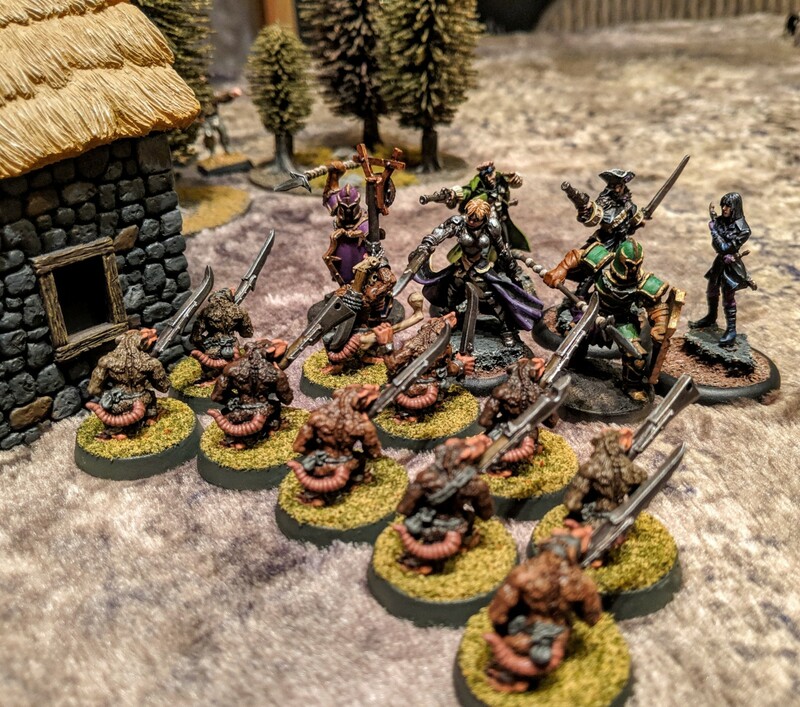 After a pursuit that stretched for nearly a week, a veteran expeditionary force from the Empire, led by the magic-user known as Razmina the Yellow, had nearly caught up with Snik Soot-Fang and his cadre of skittering Skaven fighters. Determined to bring the ratmen to battle in proper fashion, Razmina took a small band of outriders, backed up by Blue Wing, a noble dragon, and placed them athwart the burnt-out ruins of Felstaff Manor — itself a victim to the Skaven’s plunderings earlier in the year. 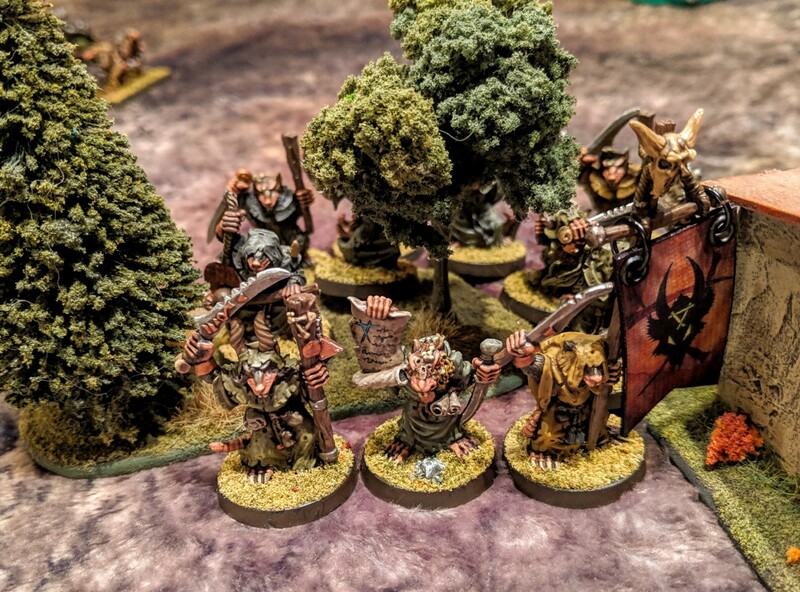 As the apples on the few remaining trees in Felstaff’s orchard ripened in the autumn sun, the Snik Soot-Fang and his warriors emerged from a copse of trees and prepared to face the Razmina’s warband, including the King’s Own Crossbowmen and the fearsome Knights of Tralain. But their pending clash was cut short by the arrival of a new and ghastly enemy. Surging over the hills to the east came an ethereal spirit host. With a chorus of flapping robes and jangling chains, the Nighthaunts swept onto the battlefield to slaughter man and Skaven alike. Thus, the stage was set for a three-player game of Dragon Rampant earlier this month between me, Vincent, and Oliver. For me, this was an opportunity to get my new, as-yet-unblooded Skaven army on the battlefield. Likewise, Oliver was fielding his newly painted Nighthaunt army. Dragon Rampant is a medium-sized skirmish game with fairly flexible unit composition rules. As written, a typical army would consist of 30 to 40 figures per side. But DR has a nicely developed set of rules for larger monsters and war machines, so players can certainly field armies consisting of almost any combination of models from their fantasy collection. We opted for the Bloodbath scenario — the simplest option that would let us come to blows quickly. I deployed my Skaven in a small wood (surmising, I suppose, that they were lying in wait to ambush the Razmina’s warband). Oliver deployed his Nighthaunts on a low moor, from whence they would swoop down onto the unsuspecting combatants. And Vince mustered his knights and retainers and their fearsome dragon ally in a clearing to the north of the manor. 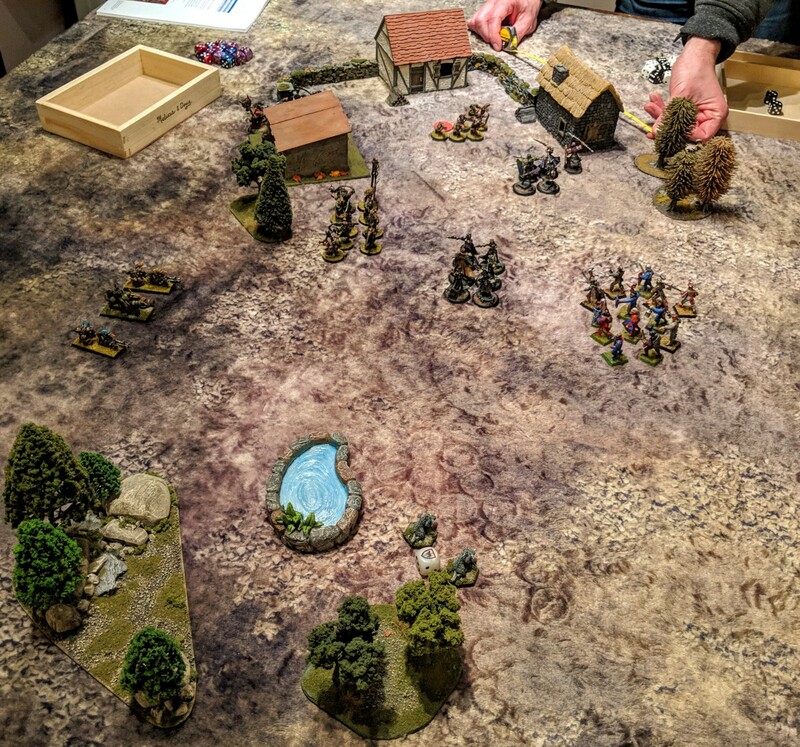 Our first turns were focused on establishing command and control — by that, I mean re-learning the Dragon Rampant rules! We’d all played before, but years ago, and we were a bit rusty. I tried my darnedest to mobilize my Plague Monks, though I’m sorry to say they mostly stayed put for the entirety of the game, preferring to stay lurk near the trees until the final turn. In the photo above, you can see the snazzy custom vinyl banner that I commissioned from a guy on Facebook for my Plague Monk unit. It’s really sharp looking! Elsewhere, I managed to get my Doomwheel and two Rat Ogres moving. The Rat Ogres lumbered toward the incoming Nighthaunt host, and the Doomwheel pivoted and began maneuvering around the copse of trees, angling toward Vince’s warband. Activating units in DR is risky, and not a sure thing. The game has a “turnover” mechanic similar to Song of Blades & Heroes, where there’s always a risk that your turn will end prematurely if you flub an activation roll. I appreciate mechanics like that because they do a nice job of modeling all of the various unknowns that can befall an army in the field (bad communication, troops balking at orders, infighting, exhaustion, bad weather, etc), without having to resort to a super granular rule system where you’re rolling a million dice to see which direction the wind is coming from, or to see if some dude’s sword broke during his attack. Speaking of swords … over on the northern flank, Vincent managed to activate one of the most notoriously fickle units in the entire game — his elite knights! These guys hit hard, but they’re difficult to activate and they’ll occasionally charge without warning at the closest enemy model. Still, seeing those thundering hooves is enough to send shivers down anyone’s spine…unless you’re Oliver’s undead army! Ha! We chuckled throughout the game about how Oliver’s Nighthaunts “feel nothing,” which means they’re immune to fear and can’t receive battered results after losing combat. They also crumple like paper if they take casualties, though, so it’s a trade-off. It’s fair to say that Oliver had his choice of targets as he mobilized his army and swooped down off the hill. On his right, the Knights of Tralain were thundering toward his undead legions. On his left, he saw lumbering Rat Ogres followed by the ratmen beyond measure. The first clash came when Oliver’s undead infantry wheeled around the corner of the ruined manor and crashed headline into Vincent’s knights and dragon. Savage, no quarter close combat ensued for several turns, but ultimately the knights prevailed, hacking their way through the brittle husks of the Nighthaunts. 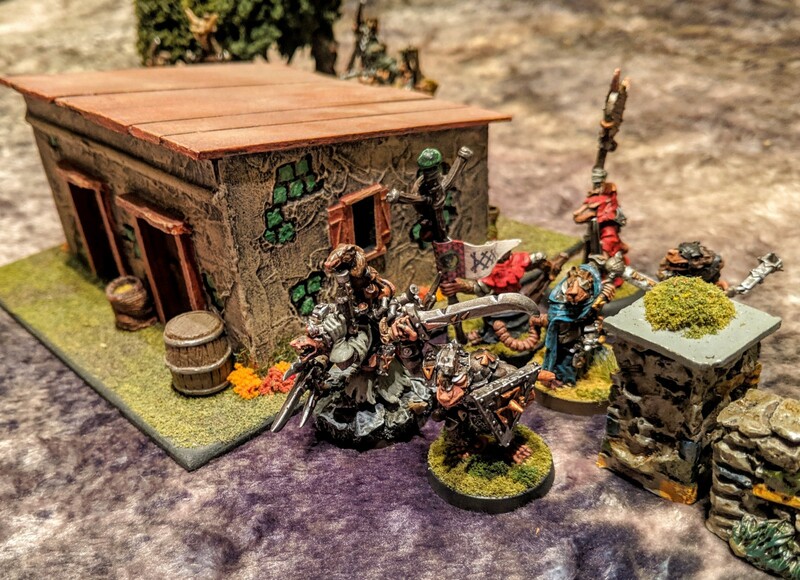 Oliver fared better against the Skaven when his wraiths charged into the Rat Ogres, carving up the loathsome mutants and scattering their remains across the grassy field. At this point, I was reminded of the game’s brutal morale mechanic. For most units, once you fail a courage test and become “battered,” it’s difficult to rally and become an effective fighting force, at least in a typical game. It’s more likely that your battered unit will continue to retreat and bleed casualties for the rest of the game. This does a decent job of pushing the game toward an inevitable conclusion — once a player has several battered units, it’s clear that the endgame is approaching, which is nice because nobody wants to play a 4-hour skirmish game! In the case of the Rat Ogres, these guys were my first two casualties, and they died without doing much of anything! My strategy at this point was to seize the manor and orchard in the center of the table and hopefully improve my defensive position. My Stormvermin (“heavy foot” in the parlance of Dragon Rampant) were fairly good on the defense, so I figured I’d have have a good chance of surviving if I could make my way to the manor. So that’s what I did. It took my guys a fair few turns to vault the gate and occupy the manor, though, because Razmina the Yellow kept casting a spell on them that imposed a movement penalty. But we made it! Next stop – Schwarzholm. Or will we go to Rogenwald?! It couldn’t have happened soon enough, because Oliver’s fearsome leader — Lady Olynder, the Mortarch of Grief — was bearing down on my flank. Remember those Plague Monks who refused to move? Yeah they got slaughtered to a rat when she crashed in. They dealt a few points of paltry damage to Lady Olynder in response, barely enough to warrant a courage test, but then, to Oliver’s utter shock and horror, Lady Olynder FAILED HER COURAGE TEST with such a terrible result that she actually fled the battlefield. Wow! We immortalized the moment when the dice rolled snake eyes and we knew her fate was sealed. With the departure of Lady Olynder and the losses against the knights, Oliver had been defeated, which left Vincent free to bring the full force of his knights and dragon and skirmishes to bear on the depleted Skaven forces. But — remember my clever strategy of seizing the manor house? Well, it finally paid off! My Stormvermin were able to form up into a “wall of spears” formation (this is actually a thing in Dragon Rampant) and withstand a charge by the knights! That left Vincent with Blue Wing the dragon, who at this point had been badly mauled by its prior engagements with Oliver’s wraiths. I peppered him with fire from my three Skaven weapon teams (defined as “heavy missiles” in Dragon Rampant) as he maneuvered for a final charge. Before Blue Wing could activate, though, I finally managed to mobilize my Doomwheel, sending the cranking, clattering contraption hurtling toward the dragon at full speed. In one cataclysmic round of combat, the game was over for Vince. And so the rats emerged triumphant! But honor demands that I tell you that this game requires an asterisk (*) in my victory column. You see, I had a string of absolutely terrible activation rolls earlier in the game — literally two or three turns where I was able to activate zero or one units. Vince and Oliver both very graciously decreed that, because I had brought tasty marionberry cider for everyone to enjoy, that I could have two re-rolls to salvage my horrible activations. So I proceeded to use these, and I’m certain that my victory is due only to their generosity and sportsmanship. I doff my cap to their magnanimity. All in all, we enjoyed the hell out of Dragon Rampant this time around. One thing that crystallized for me this time was how much I enjoy the fact that everyone plays from the same basic army list and has access to the same roster of units (with a few tweaks here and there). That removes a lot of the “gotcha” moments that tend to arise in games like Warhammer 40k, where there’s so much semi-hidden knowledge that you reveal at decisive moments (like a well-time power or strategem that your opponent didn’t know about). In DR, everyone knows what everything can do, so the game is instead decided by battlefield tactics, tough decisions, maneuvering, and a bit of luck. That’s probably my platonic ideal for wargaming — a game that is tactically deep, but easy enough for both players to follow the action and understand the stakes as they unfold. We’ll be playing this one again soon! Nightfall on Caluphel Prime. But it was not true night, as the darkening sky was scored by thousands of beam weapons and missile trails. A mighty naval clash was taking place in low orbit, pitting the Imperial Navy’s ships of the line against a Death Guard battlegroup commanded by Typhus himself from the bridge of his fearsome battleship Terminus Est. The Imperial ships were struggling to land men and materiel to Outpost Omicron — a frontier settlement currently held by the Maggot Magnates. The venerable Chaos Space Marines had been hand-picked by Mortarion to implement the final endgame on Caluphel Prime. Opposing them at the Outpost were the advance elements of the Bareaga 402nd and a contingent of Adeptus Astartes from the Salamanders chapter. After days of constant, grinding combat at Outpost Omicron, both opposing factions were caught off guard by the arrival of Hive Fleet Tiamat. The sudden appearance of the Tyranids opened up a new front in the desperate battle to save Caluphel and prevent the Death Guard’s diabolical machinations from coming to pass. So that’s the setup for “Cloudburst,” the final chapter in our Caluphel Awakenings campaign. Paul, our stalwart GM for this campaign, really pulled out all the stops for this game. As before, we structured it as an Apoc-Luck game day, where we rented out a local rec center, brought food to share, and played out a massive 40k apocalypse-sized game to determine the narrative outcome of our campaign. At the outset of our apocalypse game, Paul walked us through some of the major plot points that had developed over the course of the 6-month campaign. He even brought visual aids — what fun! If you’ve not caught up on Caluphel Awakenings, please do check out everything we’ve been up to since July. 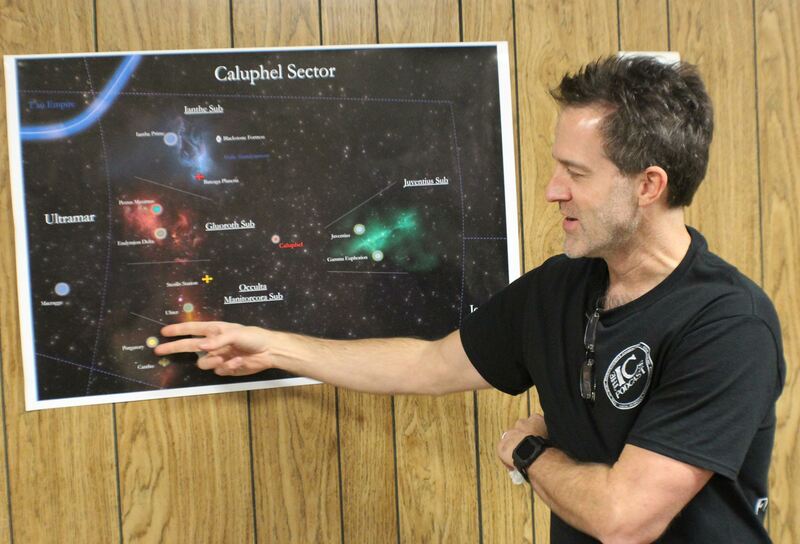 The goal of the campaign had been for us to further develop the lore, factions, backstories, and maps for the entire Caluphel sector. This we achieved with great aplomb — check out the sub-sector writeups that were contributed by the campaign players! Paul had set up a massive two-front game. The Imperial defenders would deploy on a central hilltop dominated by a landing zone and some basic fortifications. 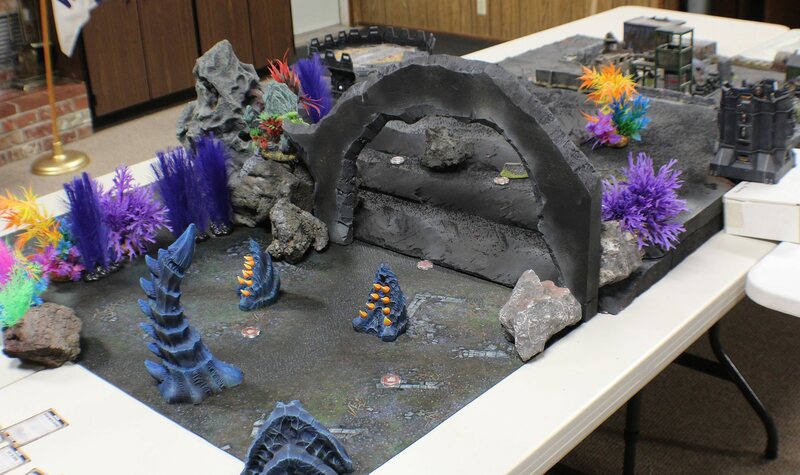 They would be tasked with holding the Tyranids within their cavern strongholds, lest their feeding pits link up with the Hive Fleet in orbit (the large stone archway denotes the entrance to the subterranean battlefield). In addition, the Imperial players must also duel with the Death Guard in the narrow streets of Outpost Omicron, in a desperate attempt to prevent the Chaos Space Marines from releasing the Chaos God Malice from his prison. So you know, just another day in the office, no big deal. This game (like all of our games) used only painted models. As always, we were floored by the visual spectacle of beautifully painted armies clashing on a battlefield of gorgeous terrain. Here’s a look at the battlefield at the outset of the game. We had a third game set up — a covert operation by the Adeptes Astartes Forgotten Suns chapter to thwart a Genestealer Cult who strive to birth an evil almost as dangerous as Malice. We’d planned to run it as a Kill Team game concurrent with the main apocalypse game, with subsequent impacts on the narrative outcome. Alas, Vincent wasn’t able to join us to Paul reconfigured the game to focus solely on the apocalypse game. With that settled, we began unpacking our armies and munching on some of the snacks scattered around the room. 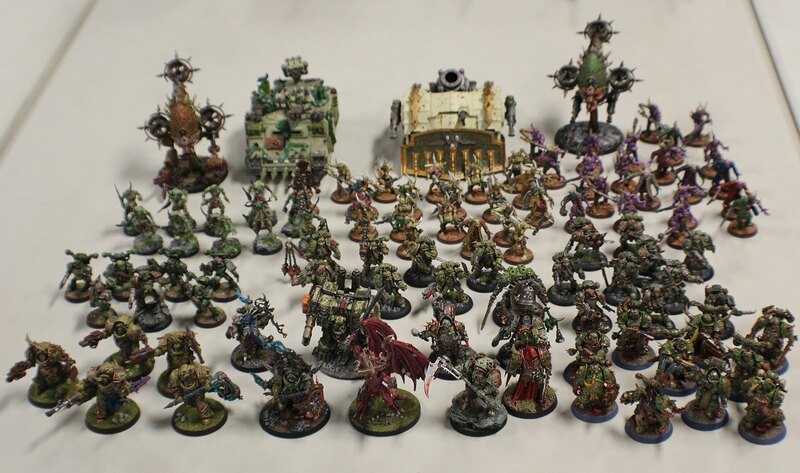 Here’s a look at the “armies on parade” at the outset of the game. And likewise, on turn 1 the massed infantry and armor of the Imperial Guard were facing a purple horde of Tyranids charging out of the cave entrance directly into their ranks! This really added to the playability of our game … armies didn’t have to waste hours of time crossing empty fields to engage. The meatgrinder got underway almost immediately! Each side of the battlefield featured 3 minor objectives and 1 major objective. Each was scored at the end of each turn. We used a whiteboard to keep a running tally of the score as each faction racked up the points. Having lots of objectives that scored often created a very dynamic battlefield where individual maneuvers and key command decisions carried a lot of weight. Just like last year, we used a timer to keep our turns short and sweet. Turn 1 was limited to 30 minutes each. Each subsequent turn was limited to 20 minutes! We learned to pre-plan our moves, play fast, and prioritize unit selection to make sure we got the most out of our time “on the clock.” With such brief turns, everybody was bound to forget or overlook something. It just added to the overall chaos of the battle! With such a massive battle, I wasn’t able to capture the turn-by-turn action, but I got the overall narrative flow. As such, I’ll divide up this report into “early turns” and “later turns” for both sides of the battle. On the left flank of the Imperials’ deployment area, the Imperium’s greatest asset — its endless waves of human soldiers and sturdy armored vehicles — were deployed at the cave entrance. Success for both the Tyranids and the Imperials was dependent on pushing into the opposing deployment zones. Jim’s 42nd Auxiliary Armored Fist battalion staged three Chimeras right at the front line, each packed with infantry squads. Buoying them at the front line was Jim’s newly painted Knight Warden — a truly monumental “miniature” (if the term could even be applied to such a behemoth) that Jim had completed just a few days prior to the game. 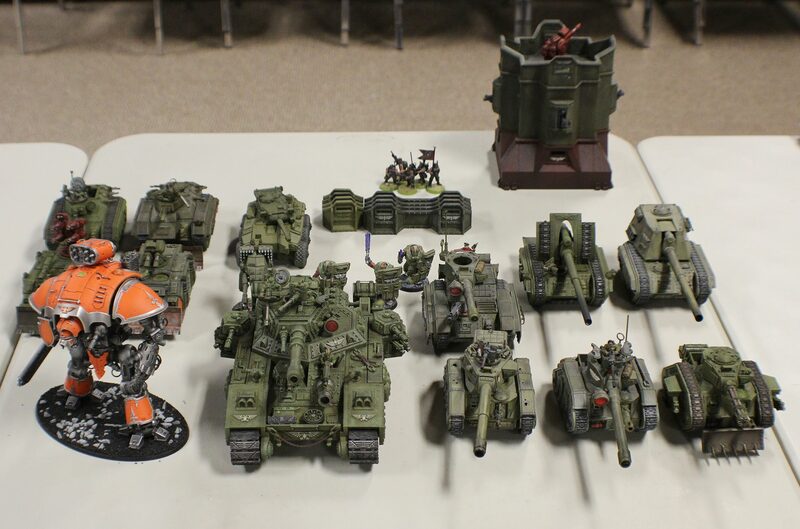 Behind the front line was a “wall of steel” — Leman Russ tanks, more Chimeras, two Basilisks, and a mighty Baneblade, supported by Imperial Guard heavy weapon squads emplaced behind barricades and sandbags. Facing the defenders of the Imperium was the boiling horde of xenos from Hive Fleet Tiamat. 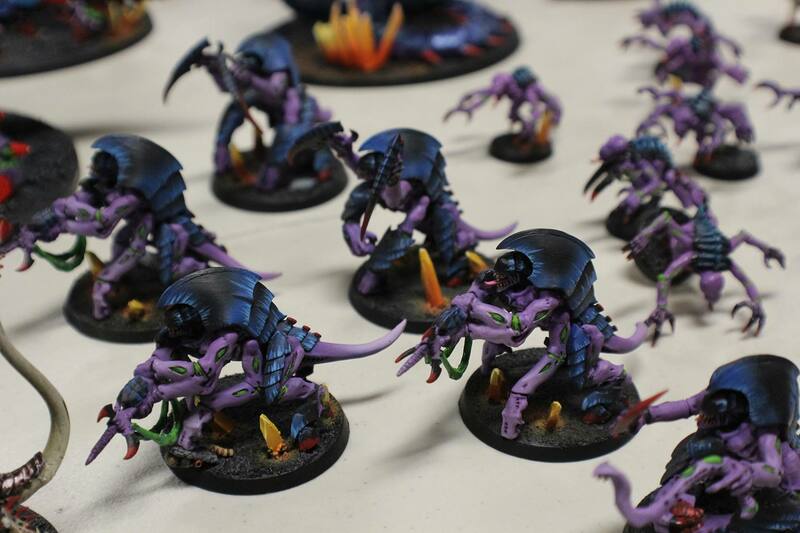 Paul put two units of 15 Genestealers all along the front line to soak up wounds. But behind them were the monsters — two Carnifexes, a Tervigon birthing Termagaunts, and a massive Barbed Hierodule with twin barbed strangler guns and massive scything talons. What force could stand against such inhuman savagery?! The Imperials took the initiative in the first round, firing salvo after salvo from their emplaced tanks and guns into the swarm of Genestealers. The massive onslaught had predictable results, wiping out entire squads and leaving a hole in the Tyranid front line. However, these losses were inconsequential to the Hive Mind. Paul’s genestealers fell back, then he moved up his big monsters and fired their gruesome bioweapons directly into the Chimeras that were guarding the central objective. The Chimeras withstood the long range venom cannons of the Tyranid warriors, but withered under the crackling energy of the Hierodule’s guns. With a hole now blasted in the Guard’s flank, Paul sent his Tyranids charging in. The remaining Chimeras were cut down by the Carnifexes (Carnifices?) and at the bottom of the round the Tyranids had successfully exited the caverns and were beginning to rampage into the Imperials’ landing zone. As the xenos approached, the Guard held firm. Jim’s Knight and Baneblade focused their attention on the Carnifex holding the center objective and their combined fire brought it down, chittering its rage as it fell apart. The two remaining frontline Chimeras continued a grinding melee against the Termagaunts and the remaining Genestealers. But there were simply too many bioforms for the vehicles to overcome. For every Tyranid crushed under tire tread and track, two more emerged from the caverns to throw themselves against the tanks. When the Tyranids counterattacked, the next wave of vehicles exploded under the crackling energy of the biofire. Jim’s Knight fell apart, kneecapped and billowing smoke. A Leman Russ melted into the earth and a third Chimera was sliced open. Jim desperately hoped for one of his vehicles to explode and take down Tyranids with a death-blast of fire, but roll after roll gave him no relief. All the vehicles went down in defeat with no explosion. So, too, the mighty Knight. 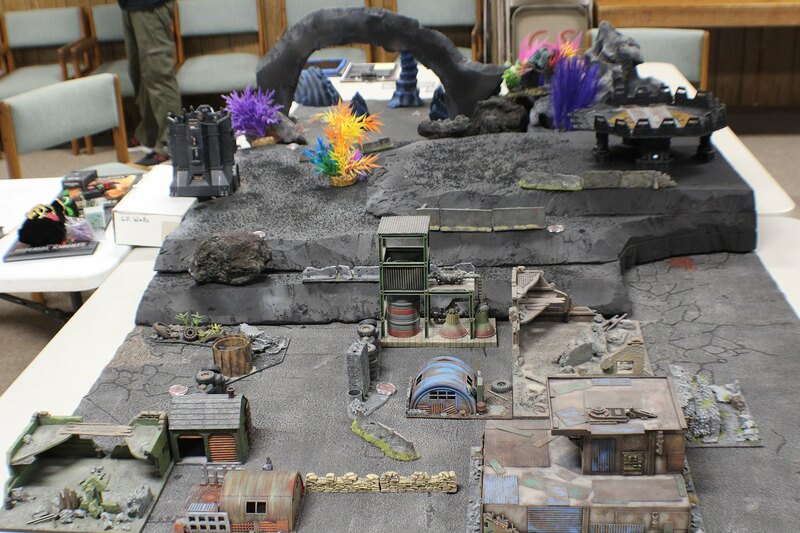 Across table, in the ruined streets of Outpost Omicron, the other sector of the battle began with a sustained barrage of firepower from the Salamanders Space Marines. The Maggot Magnates absolutely choked the street, giving the Astartes an embarrassment of targets to choose from — moaning hordes of Poxwalkers, trudging squads of Plague Marines, ghastly biomechanical daemon engines, and even a few tanks. 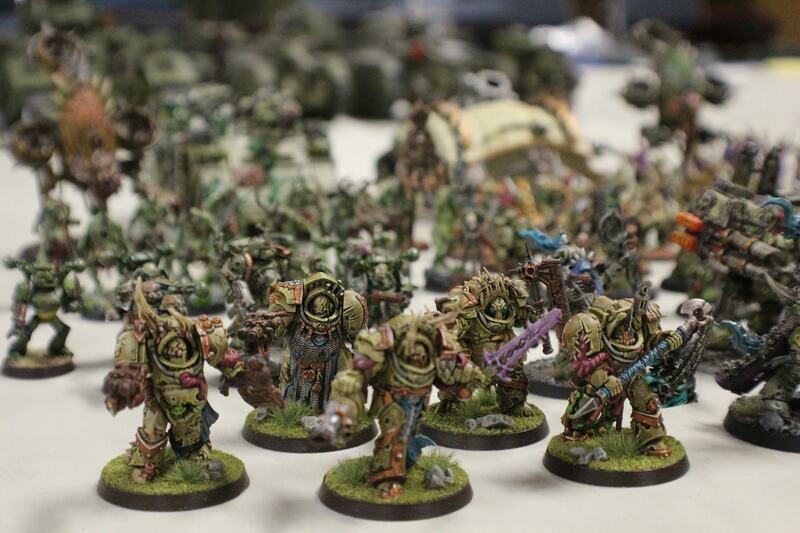 The salvos fell among the Death Guard and immediately began doing damage. But the front lines pushed relentlessly forward, engaging with the advance squads of Salamanders even as fast-moving assault units fell among the Astartes’ backfield support. At this point, I began a series of rather spectacular dice rolls related to the Death Guard’s Disgustingly Resilient keyword trait. Time and time again in this game, Disgustingly Resilient would save my bacon in the face of almost certain annihilation. And so the Maggot Magnates mobilized, trudging forward in the face of deadly fire from the Astartes. On the front lines, Typhus hefted his manreaper scythe and urged on the hordes of poxwalkers. Spewing smoke and trailing a stream of foul ichor, a Helbrute stomped to the head of the pack and paused to unleash the full force of its lascannons into an Astartes Land Raider that was mere meters away, such was the devastating proximity of the two armies. Even as I advanced, I tried to mess with Alex’s backfield as much as I could. He had several concentric lines of Salamanders behind defensive formations; these I targeted with my flying daemon prince and with my hovering bloat-drone. After a couple turns of combat, we agreed that Alex’s Salamanders were incredibly resilient! They benefited from re-rolls and special rules that made it possible to resurrect slain characters! Plus, Alex had lots and lots of guns pointed at my Death Guard, which is basically where you want to be in a game like this. Elsewhere, my bloat-drone armed with a fleshmower plowed into a squad of terminators, beginning an epic melee that would last for most of the game (though the bloat-drone fleshmower would fall early on in the clash). As turn 3 began, the battle in the skies above took a desperate turn. Tentacled Tyranid hive ships began to grapple with the battleships and cruisers of the Bareaga 402nd, and debris began raining down on the battlefield below. In the chaos, a mortally wounded bio-vessel plummeted out of the sky, roaring over the battlefield to crash into the mountain across from Omicron Outpost, earth and rock fountaining up into the sky. From the smoking crater came an unholy roar, and the defenders of the Imperium were utterly stricken to see a massive Hierophant Bio-Titan lurch to its feet and emerge from the crater. This was Paul’s big reveal — he had acquired and painted up a Heirophant model especially for this game. He had played his cards close, not telling anyone about the big twist until the moment when he unpacked his brand new toy from its foam carrying case. There was much chuckling from Jim and Bif, as they had both discussed — and summarily discarded — the possibility of Paul bringing a Bio-Titan. Hah, the joke’s on them! Paul wasted no time in putting his shiny new toy to work. The Heirophant instantly became Public Enemy #1 as it pulped squads of Guardsmen and ripped into the Baneblade. Of course, Paul was a benevolent GM for this campaign finale. He wasn’t just going to spring a surprise like that on the Imperial players without giving them something in return. That “something” was a heavy lifter blasting down from orbit to deliver another Knight to face off against the gargantuan titan rising from the earth. Huzzah! I don’t have a picture of the moment the knight arrived, so how about another pic of the Heirophant looming over a battlefield full of soon-to-be scrap metal? The arrival of the Bio-Titan seemed to signal a turning point in the battle versus the Tyranids. Jim’s Baneblade and Knight lashed their combined firepower at the Heirophant, while his last Guardsmen and Sentinels held the final positions at the summit of the landing field. 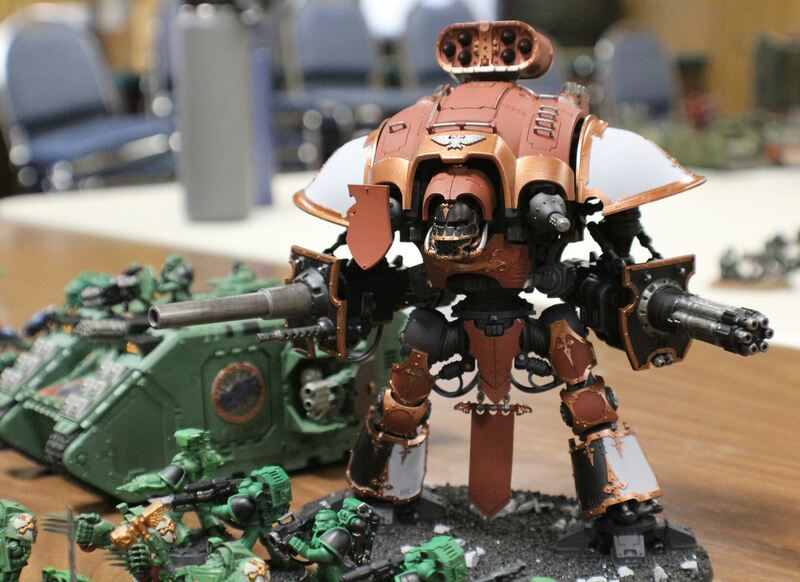 However, the Bio-Titan seems to just shrug off their fire and in one turn hollowed out both the Baneblade and Knight. Jim returned fire on the next turn killing the two Carnifex’s and the birthing machine Tervigon. From their furious death cries, the earth rose up and a burrowing Trygon took their place on the slopes leading up to the landing pad. Alex surprised everyone by resurrecting his slain company commander with his veteran apothecary’s nifty ability, returning the potent leader to the battlefield as the game entered its critical final turns. At this point, most of my best units had been shot to pieces, leaving just a core of infantry — namely, those nigh-unkillable poxwalkers! We took a look at the points tally on our side of the board and found that this was going to be a very, very close game. It would almost certainly come down to one or two victory points. With that in mind, Alex and I both made our final moves to seize the objectives scattered around Outpost Omicron. For this task, I had my ace in the hole — the Hideous Bloom, my squad of Blightlord Terminators that arrived via deep strike and began an implacable advance directly into the heart of the Imperial lines, shrugging off small arms fire as they went. These guys were the newest miniatures I had completed for my Death Guard army, and we made many jokes about how their fate was sealed — like all newly painted minis, they would certainly be killed before they had a chance to do anything of note on the battlefield. It is known. But! The gods had a sense of humor this day, and it came to pass that my Blightlords were able to play a pivotal role in the final endgame. After that, they swept up the hill and into an Imperial Guard heavy weapon squad, killing as they went. Blood, pus, and ichor flowed like water as the Hideous Bloom marched onward. At the end of the game, one Blightlord remained alive to contest a crucial minor objective. Defiant to the last. But the battle would be decided elsewhere, by none other than the Herald of the Plague God himself. Typhus, who had been leading more or less from the back for the entirety of the game, finally strode forth on the final turn to slaughter the remnants of a squad of Terminators and (with the help of some Poxwalkers) seize the major objective. We all agreed that it was incredibly fitting that a final, pivotal play of the game came down to Typhus. It’s always nice when your awesome named characters get to steer the narrative outcome. Anyway, that sealed the deal for the battle in Outpost Omicron. And with the Heirophant Bio-Titan rampaging virtually unchecked on the other side of the table, it seemed that doom had come for the forces of the Imperium. 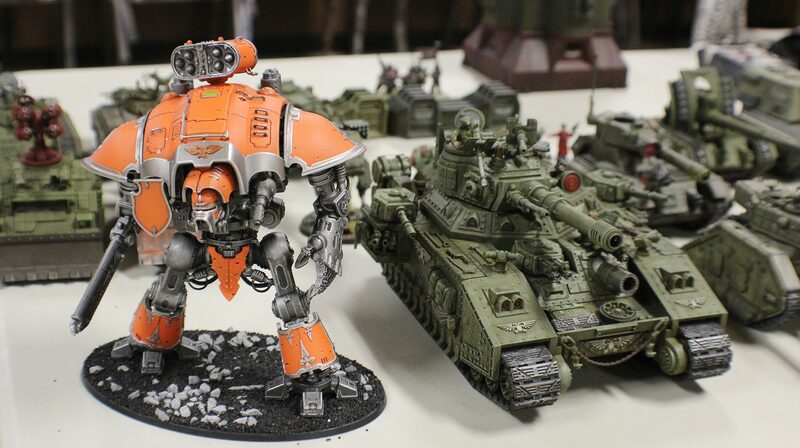 In one of final actions of the game, the Bio-Titan directed its full firepower at the Alex’s Knight standing in the middle of Outpost Omicron. Paul rolled dice for what felt like 10 straight minutes as the beast unleashed stupendous punishment on the gallant Knight. Incredibly, the Knight made its saves — withstanding the firepower that had killed everything else in its path! But it was a pyrrhic victory, as the Imperial lines were collapsing and utter annihilation was imminent. With that, the game came to an end. At battle’s end, the combined victory points of the Tyranids and Death Guard clinched a Total Victory over the forces of the Imperium. Paul had mapped out a variety of scenarios for each possible combination of outcomes for the game. This outcome was certainly the most dire — the Death Guard were able to detonate the control mechanism and release the Chaos God Malice from his prison where he had slumbered for untold millennia. So violent was his reentry into the material plane that the planet Caluphel literally cracked into pieces, atmosphere aflame and millions of inhabitant dying in the emptiness of space. Here’s Paul graphically describing what happened to the planet as Malice roared to life. In addition, the Total Victory outcome meant that Hive Fleet Tiamat crashed headlong into the Caluphel Sector, sending three tendrils of its army snaking through the various sub-sectors that we had mapped out earlier. 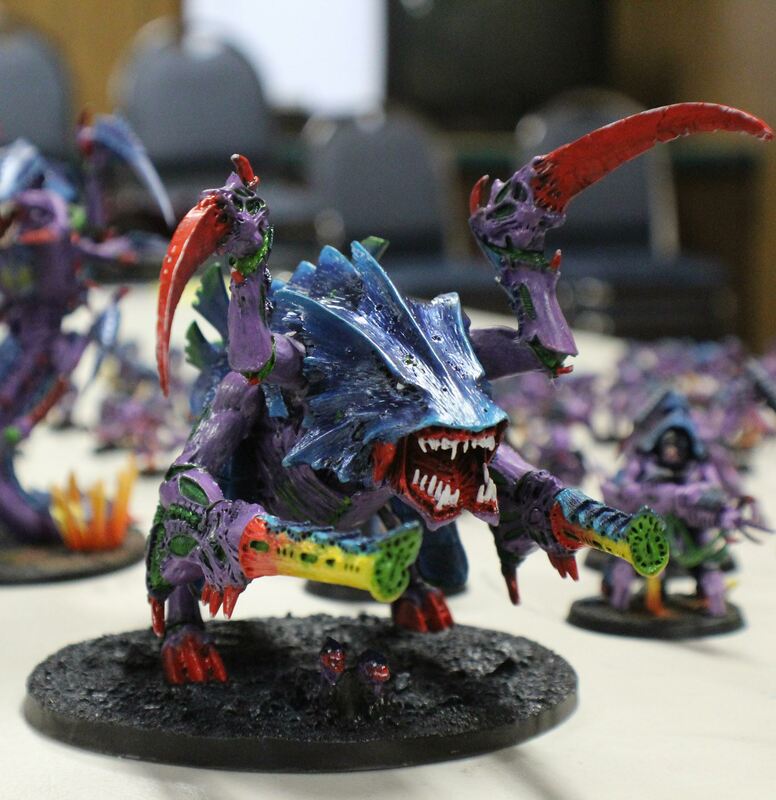 The three tendrils represented the Tyranids’ overwhelming momentum coming off the victory on Caluphel Prime, and they also spelled certain doom for the beleaguered Imperial defenders elsewhere in the sector. Here’s a look at the map showing the Tyranids’ gains. Amid the chaos and confusion, another terrifying creature made itself known. From the bio-pools of Caluphel’s caverns, the deadly Hive Queen of Tiamat rose up and then transcended to the Fleet above, annihilating hundreds of unfortunate Guardsmen in the psychic scream that accompanied her birth. 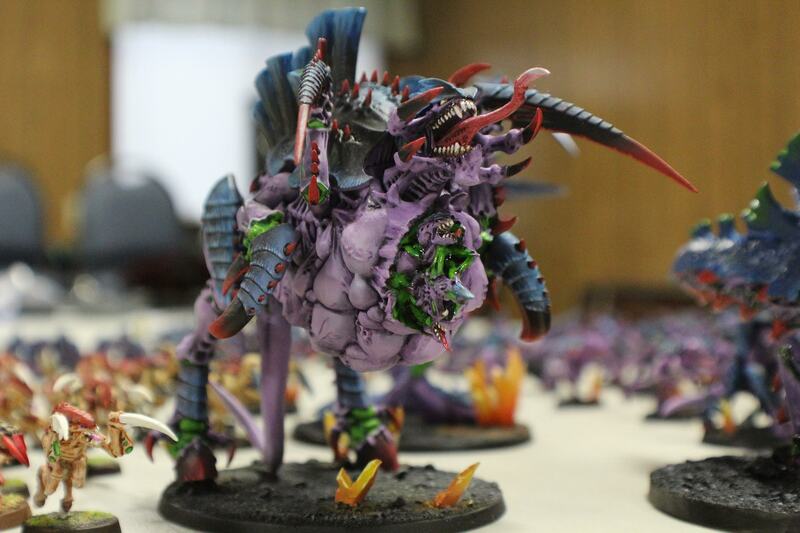 This marked the arrival of Paul’s Hive Queen, a new model he had commissioned by Colin Ward to lead his Tyranid army. Here she is in all her sensual glory. But wait! There’s more. Paul had drawn up an entire postgame show for us to commemorate the Caluphel Awakenings campaign. Each of us got a special award for our contributions to the campaign, and Paul surprised us by unveiling a custom plaque for the campaign winner. As you can see, it’s got blank spots so it can be used repeatedly for future campaigns. The idea is that each year’s winner gets to hold onto the plaque until the next campaign, kind of like a Warhammer 40k Stanley Cup. Now is the part where I tell you that this year’s campaign winner was actually yours truly! All of the monthly contributions — painting, writing lore, making maps — had points attached to them, and I managed to sneak out a win for the overall five-month campaign. So the plaque goes home with me! Actually, it’s already on display in my workshop. Doubtless I’ll have some stiff competition next year — these guys will be coming for my title! Thus ends another incredible satisfying Warhammer 40k campaign. This one really pushed our small game group to new heights of painting, modeling, and narrative gaming. Paul masterminded this thing from start to finish, and we all gave him a hearty round of applause at the end. Follow along on Comrade’s Wargames to see where we’ll go from here! 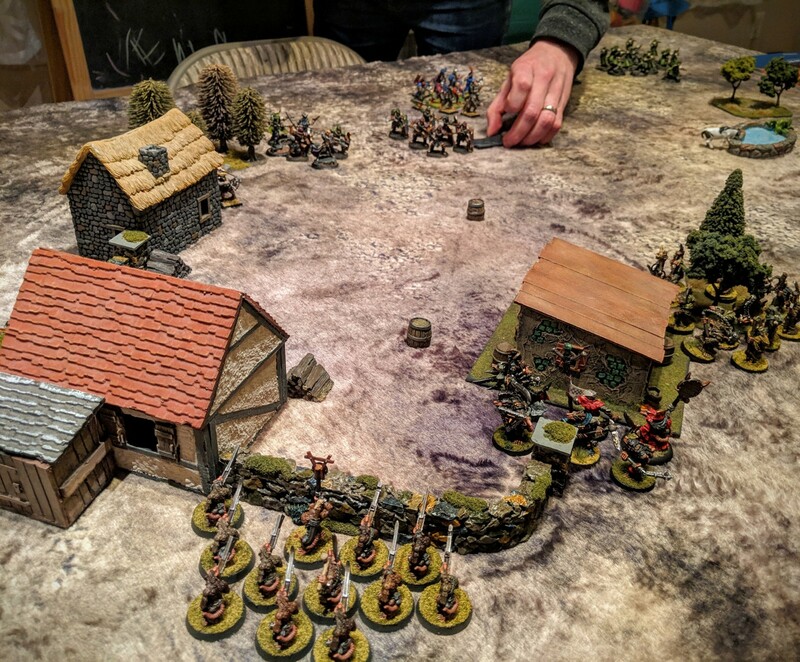 Earlier this month, a few of us got together for an evening of Kill Team, the new, skirmish-sized wargame set in the Warhammer 40,000 universe. 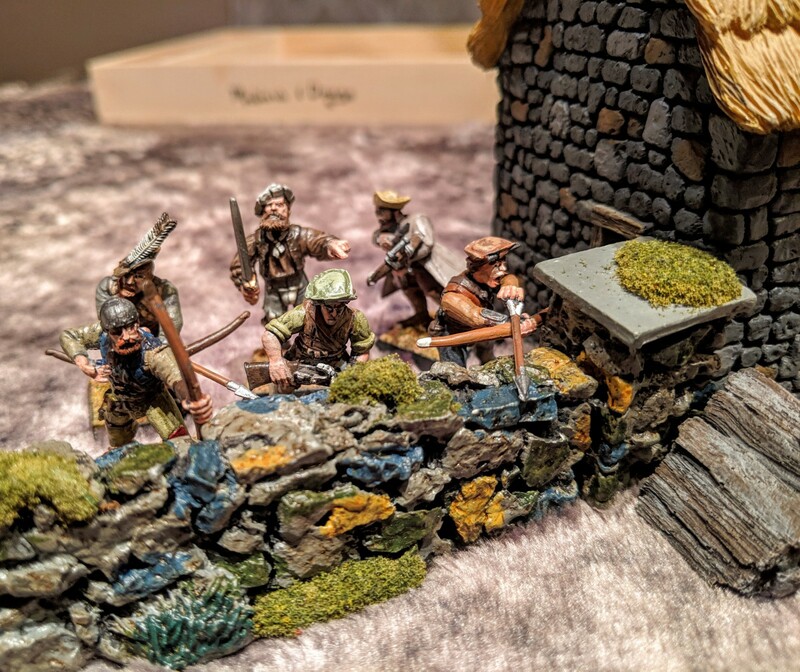 Longtime readers will know that I absolutely adore skirmish gaming for a variety of reasons: games require a small number of figures, which allows you to really spend time making your warband look great. Also, games are usually a bit shorter than typical wargames. And skirmish games really shine in campaign play, and I was pleased to see that Kill Team appears to have a well developed campaign system contained in the core manual. For our game, we set up a cramped urban battlefield with lots of back alleys and elevated positions, along with a few cratered open spaces (the term “killing field” came to mind). From a narrative standpoint, the game was set in Saint Scythia Starport, a major urban area on the planet of Caluphel Prime. The factions operating planetside are jockeying for control of the starport, so this game represented their stealthy maneuvers. I was joined by two fellow gamers for this game. Paul and John had arrived earlier in the day and managed to squeeze in a game prior to my arrival, so they were thoroughly blooded by the experience and ready to head back into the fray. Here’s the one photo from their game, showing John’s stalwart Imperial Guard mopping up Paul’s Tyranids. I brought my Night Lords to the table, and it quickly became clear that adding a third player changed up the whole game dynamic. Initiative became even more important as players tried to predict and anticipate the moves of not one, but two opposing players. We scattered a few objective markers on the table, quickly ran through the scouting phase (which allows for some nifty pre-battle stuff like laying booby traps, advancing into cover, etc) and then got to the meat of the engagement. My Night Lords started in some decent elevated terrain, which offered a good field of fire for Murdock Dreadmantle, the Chaos marine gunner wielding a fearsome heavy bolter. In the foreground you can see Vanthus, the Traitor’s Heart, who is the aspiring champion for my warband. Elsewhere, my squad advanced cautiously, sticking to the shadows and waiting until the enemy presented itself. And about that enemy. Paul put a something like a dozen Tyranid models on the table, seemingly more than enough to deal with my Chaos Marines and John’s Imperial Guard. Here’s a look at the chittering xenos horrors as they began deploying from their starting area. Gagh, talk about a target rich environment! With the objective scattered widely around the battlefield, many small firefights quickly erupted. Here’s a look at John’s Imperial Guardsmen covering each other as they advanced toward the skulking Tyranids. The battlefield for Kill Team is intentionally small, which creates a tense pressure cooker type of game, where most guns can shoot the entire length of the battlefield and melee clashes are inevitable. In our game, the three factions traded blows and shots until as the action ratcheted up. My Night Lords took the lead in victory points on a pivotal turn when Yugravian the Impacable, my mighty icon bearer, raced forward to seize an objective shortly before he was swarmed with Tyranids. Here’s a look at his final stand. Despite the glorious demise of Yugravian and The Grub, the Night Lords wisely decided to retreat before their losses became insurmountable. In game terms, John and I both decided to quit the field as Paul’s Tyranids had amassed a strategic advantage and were threatening an outright bloodbath. Since we were using the campaign rules, we wanted to keep our teams intact if possible — and that meant a tactical retreat! So Paul secured victory, but I still wanted to share this final photo of Vanthus, the Traitor’s Heart, as a he charged the Imperial lines. Hoist your power swords and reap some trophy skulls — the Night Lords have come for you! Afterward we discussed the game. We loved the way Kill Team players — the alternating activations added a LOT of tactical depth, and the tactics really encouraged innovative gameplay. It seemed like we never managed to carry over unspent command points from turn to turn, so a lot of the more expensive tactics were essentially out of reach for us. We also agreed that the tabletop looked completely badass in every possible way. The terrain from the Kill Team boxed set looks nice with a basic paint job, and I was able to augment the battlefield with some items from my massive personal terrain collection. And of course, the our warbands looked fantastic, with nary an unpainted model to be seen anywhere. Only the finest quality gaming for readers of Comrade’s Wargames. Bottom line: Kill Team is fast, fun, and eminently replayable. We’ll play this one again soon! Last month I managed to squeeze in a quick introductory game of Open Combat, the fantasy skirmish ruleset by former GW-er Carl Brown. My opponent was Vincent, with whom I enjoyed a game of Song of Blades & Heroes earlier this summer. We both appreciate small-to-medium-sized fantasy skirmish games, and we’d both been eager to try out Open Combat. Longtime readers may remember that I’ve actually played Open Combat twice before — back in November 2014 and March 2015, respectively — well before Carl’s successful Kickstarter and back when the rulebook was a slightly less refined DIY production. I enjoyed the game back then and have been looking forward to playing it again one day. I’m sorry it took me 4 years to find my way back to Open Combat! But I digress. For our game, we set up a basic battlefield in my gaming den — some ruins, some trees, some scatter terrain, all anchored by my big ol’ tree tower centerpiece. Open Combat suggests a 2×2 foot playing area, which is quite small and really forces the action early. I think the battlefield I set up was just a little bit bigger, but still roughly that size. For deployment, we used one of my favorite aspects of Open Combat — the “confrontation” deployment method. Rather than having both sides start on opposite table edges, “confrontation” style lets each player alternate placing figures anywhere on the board, no closer than 8″ away from each other. You end up with a highly dynamic setup for turn 1! I started the game with a bang, when Vath’Shuga the Cauldron of Rage (my mighty pink demon) flew up to the top of a creaky walkway and began calling down curses upon Vince’s men-at-arms. Open Combat is fairly generic by design, and the game encourages you to use whatever mechanics and rules you’d like to model the equipment and capabilities of each individual figure. So in the case of Vath’Shuga, I wanted him to be able to issue curses to figures across the battlefield, so I gave him a ranged combat attack to represent that power. It also suits the figure itself, with that gnarly extended arm where he’s like claiming a soul or whatever. “YOU… YOU’RE MINE.” Yeah, good stuff. Elsewhere my dark, corrupted barbarians swarmed across the board to engage Vince’s knights and peasants, while Namina, his spellcaster, kept to the rear where her long-ranged attacks would be most beneficial. 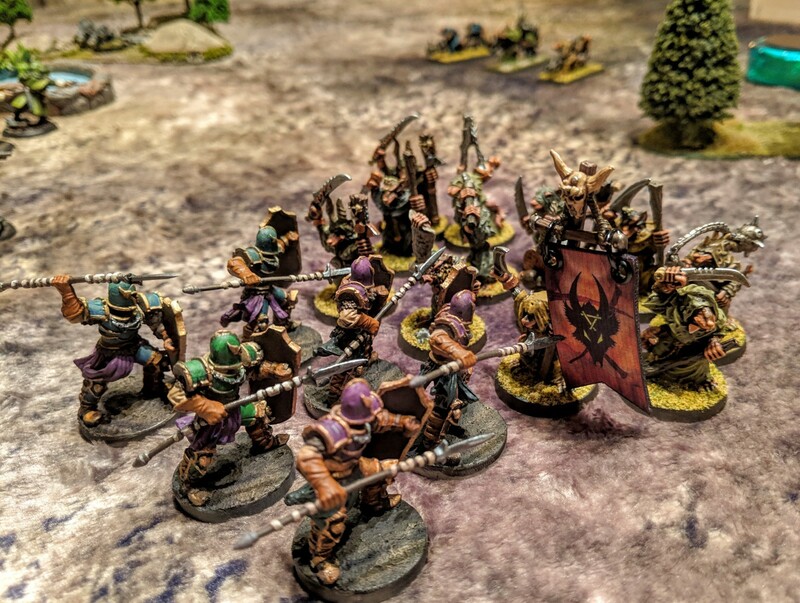 Since the battlefield was only slightly larger than two feet square, our warbands quickly became embroiled in combat (one might even say Open Combat). Little fights and skirmishes broke out everywhere. Vince’s knights advanced resolutely – albeit slowly, as he’d only given them a movement value of 4″. By contrast, Vath’Shuga moved 8″, which meant he was easily able to hunt down and corner Namina the wizard. Once she had been slaughtered and her bones ground to jelly, Vince wisely yielded to avoid more senseless slaughter. After the game we discussed the mechanics of Open Combat. Vince found the game a little more tactical and easier to grok compared to Song of Blades & Heroes. The limited list of weapons and abilities actually offered quite a bit of tactical depth. By the end of the game, Vince was already planning out how he would re-build his warband to take better advantage of the various skills and abilities and weapons. With its minimalist approach to rules and bookkeeping, the game leaves room for all manner of narrative elements. You could easily veer headlong into RPG territory by giving each player just a couple figures with super granular stats and abilities, or you could go in the other direction and try out a mass battle with 20+ figures per side as long as you didn’t give them too many abilities or special rules. Above all, Open Combat gave us a great excuse to grab some fantasy models and get them onto the table, fast, with a minimum of fuss. We’ll play this one again soon!